District Lodge W2 held their Council Meeting in Tunica, MS on October 26th, preceded by a W2 Executive Board Meeting the night before. 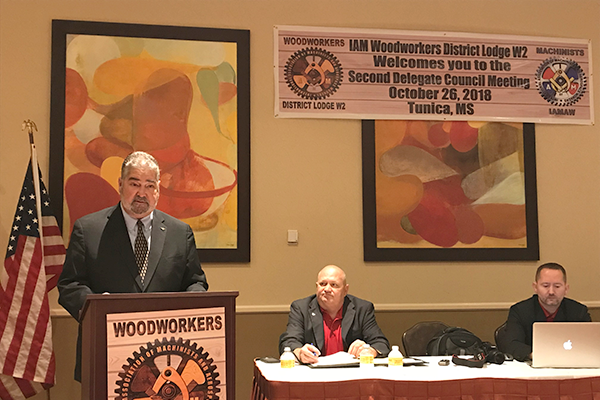 International President Bob Martinez spoke to the delegates about issues that affect the members in District W2, along with other speakers that included local politicians, GVP Rickey Wallace and Woodworkers COS Mike Rose. The conference was chaired by District W2 President and Directing Business Representative Kelvin Godwin. IP Martinez spoke directly about recent layoffs at Red River Army Depot. He assured delegates that the Machinists Union will continue to do everything it can to assist the nearly 1000 members of LL 1243 affected by these layoff in Texarkana, TX. In response, the IAM has been mobilizing politicians locally and on Capitol Hill, as well as amplified the voices of families dealing with the aftermath in the press. IAM staff has been on the ground to hold job search training and all IAM resources remain ready to fight any future layoffs here or anywhere. Martinez also congratulated and praised the District for recent organizing victory at VSC in Local Lodge 463. He encouraged all the delegates to stay in IAM’s fight and to continue aligning themselves with the new initiatives that the IP has in place for our Union. That is, spending that places the membership first, organizing for the future and ‘getting out the vote’!